These people need to step away from their phones. Snapchat is the best. Until it isn't. As with any good thing, there always is a catch. Mimi Black decided that if her date didn't show up, she could still date herself. The image was called "disgusting" by the police chief in charge of the officers. One girl used potatoes to present a message of unity that's anything but half-baked. Their lives are so much different than ours. Racist posts can get you fired. Duh. These pictures bring a whole new meaning to "high thoughts." We have Drake to thank for "YOLO." He's just trying to preach the lessons that Degrassi taught him. Whatever it takes. In order to have a bae, you must first BECOME the bae. Out of all the early '90s hip hop artists to choose from, my favorite is Carky Cark. The firefighters: "We cancelled our calendar photo shoot for THIS?!" You can't judge a person until you've drunkenly stumbled a mile in their shoes. I call it another successful day of avoiding melanoma. 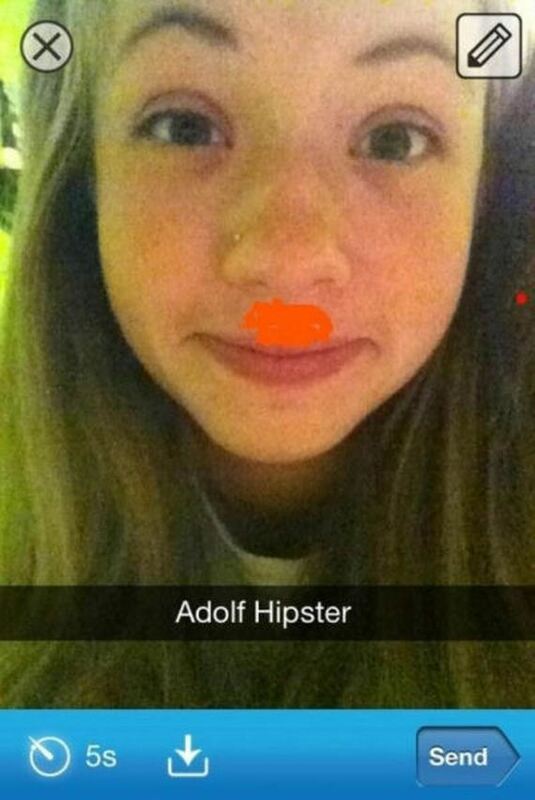 Just like the real Adolf, this one's probably not getting into art school. "But...but...I protected you from nothing!" The embarrassment is like the breadsticks: Endless. Actually, he DOES get it every day. Which brings us back to where we began this journey: YOLO. Yeah, I can't believe he could ignore a perfectly good drum kit! To be fair, that's what you get for waxing your car with honey. Rubber ducky, you're the one. You make bath time IBS so much fun. All these letters and I still can't B with U.
I should've been more clear. I said I wanted a "one night stand," but I really wanted "one nightstand." Furniture ain't cheap. He's a great actor, but sometimes true feelings come out. Well, they did say it was a contact sport. You missed a spot. Well, not actually. His name is Spot and you pretty much got him covered. It's not how tall you are, it's how big a heart you have. What we're actually concerned about here is the fact that there is no food in the freezer. This is not a fail, but rather a reason to actually go to Dunkin' Donuts. What, kids still read books? Someone give that kid a phone. Your answer for what do you really, really not want to see if you're walking down a dark alley. Panoramic pictures. They only work half of the time. The other half, they're just there to freak us out. Fish need to go on walks, too. We all wish our parents didn't have social media. But it's not even fair when they start invading ours. Some people are just very comfortable with themselves, even if we aren't comfortable with them. Why is this the only option? Maybe she's reading a book. 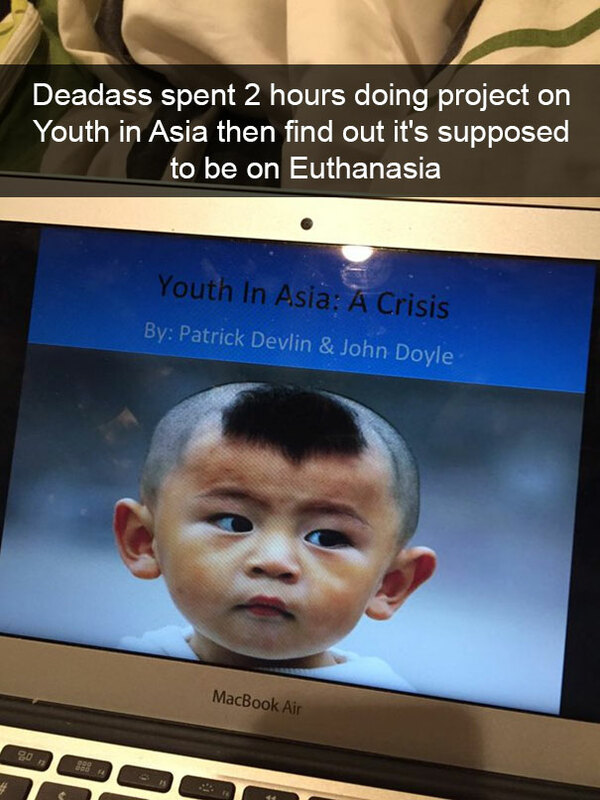 The only thing worse than this Snapchat is the fact that there was a recipient of this Snapchat. When the black bar being used to hide your identity from the internet is covers more space than the clothes you're wearing, it's really not a picture you want to be sending to your dad. I Woke Up Like What? If you keep turning up the AC so high, people are bound to huddle together for body warmth. Why won't these kinds of people just leaf us alone? Keep their spice puns at bay, right? 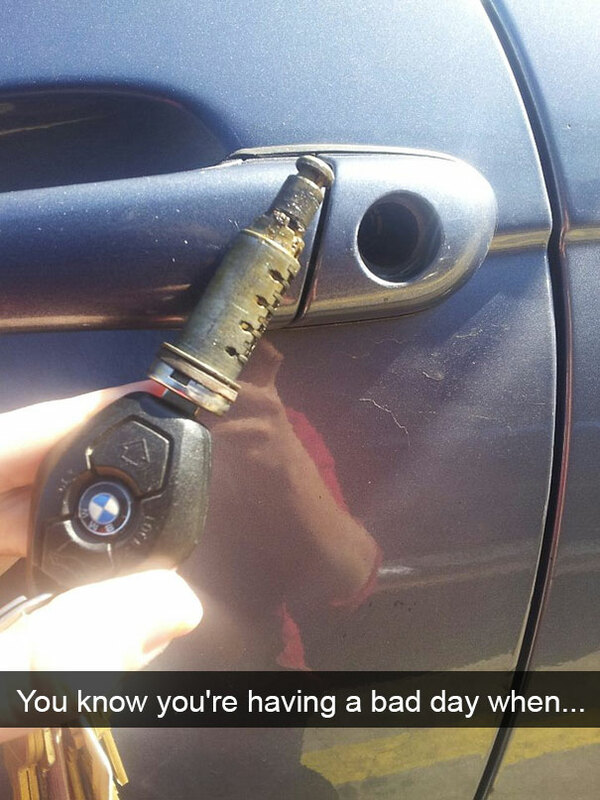 In this case, it's Snapchat being used to document a BMW fail. Sometimes it's important to read the book instead of having someone just tell you about it. On the bright side, at least they'll listen to what you're saying now. 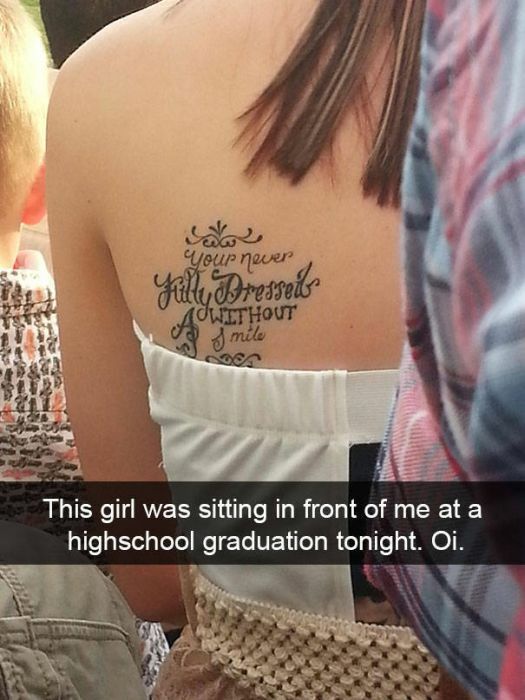 What hurts more, reading this or getting a tattoo? Is there a hairstyle out there that hasn't been done before? 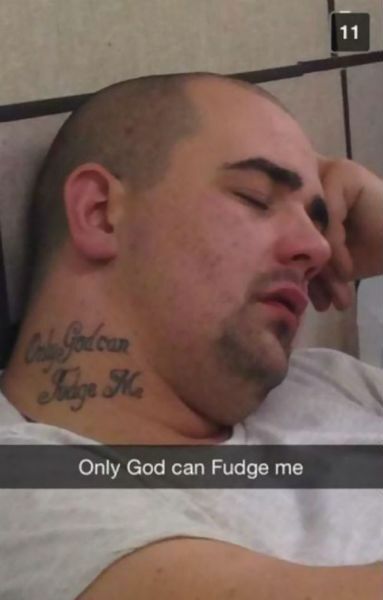 Can God give us some fudge though? Like, make it rain down from the heavens? This will make quite the pizza though. These new fad diets are insane. They're encouraging us not to eat the bottoms of things now? When will it end? At least now your mouth is going to be Irish Spring clean, and that counts for something, right? You might want to take a second to send a Snapchat to the fire department, jus' sayin'. Use this picture as a reminder that there's always someone out there having a worse day than you. Learning to drive is hard. Isn't there a Bob's Burgers episode about this? Being a parent is really just figuring things out as you go. But now they're cage free, at least. We'd like to know where this city is. Not necessarily so we can go there. Just so we know what it is. He's wearing really high socks with those shoes, so maybe you dodged a bullet after all. This could actually be viewed as an improvement on the situation.